'Super hemoglobin' allows moles to thrive underground. 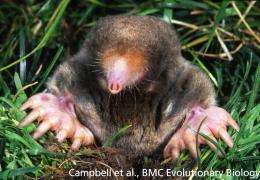 Researchers writing in the open access journal BMC Evolutionary Biology have made the first identification of an adaptation in the blood of Eastern moles which allows more efficient transport of carbon dioxide, facilitating the moles' burrowing behavior. Kevin Campbell from the University of Manitoba, Canada, worked with a team of researchers to study the blood of three underground species of North American moles. He said, "Unlike terrestrial animals, moles are routinely exposed to conditions of low oxygen and high carbon dioxide. Burrowing is difficult in itself, but is made even more challenging by the requirement to re-breathe their own expired air. We've found that one species, the Eastern mole, appears to be uniquely adapted to underground life through the evolution of a special kind of hemoglobin in their blood that greatly enhances its carbon dioxide carrying capacity". The researchers determined the genetic code for different hemoglobin components in the three mole species and measured how well these components bind to their usual target molecules. They also tested the oxygen binding properties of whole blood samples. Speaking about the results, Campbell said, "It has been speculated that the main mechanism for the moles adaptation to subterranean life revolves around the molecule 2,3-diphosphoglycerate, or DPG, that modulates hemoglobin's oxygen binding inside the blood cells. However, in the hemoglobin of the eastern mole, the key sites which would normally bind DPG are deleted, thereby allowing for the binding of additional carbon dioxide molecules". Adds co-author Roy Weber, University of Aarhus, Denmark, "It would be interesting to see if the hemoglobins of other burrowing species exhibit comparable specializations". The team envisions that this line of research could lead to the development of improved artificial human blood substitutes with specially engineered properties.